FIUGGI, Italy – Hyundai will launch 10 new and revamped models in Europe within the next two years to boost its market share beyond the 2.75 percent it forecasts for 2010. Hyundai Europe vice president Alan Rushforth said the Korean automaker increased its market share in Europe from 1.8 percent in 2008 to 2.6 percent last year, or 341.837 units, according to ACEA, the association of European automakers. Both executives were speaking in Fiuggi at the European launch of the ix35, a new medium SUV. Hyundai will launched revised versions of its i10 subcompact and i30 compact car in the middle of this year. At the Paris auto show in September, Hyundai will unveil a new small minivan. The new model, based on the same platform of the Kia Venga small minivan, will introduce Hyundai new lettering for minivans, ic. Hyundai already uses the letter i and a number to name its passenger cars in Europe (i10-i20-i30) and ix for its SUVs (ix35-ix55). In early 2011, Hyundai will introduce in Europe an i30-based coupe, followed a year later by the ix45 to replace the Santa Fe medium SUV. In mid 2012, a medium minivan to replace the Matrix will complete Hyundai product renewal cycle. The ix35, which replaces the Tucson, was unveiled at the 2009 Frankfurt auto show and will go on sale across Europe in late March priced between 20,000 and 31,000 euros. 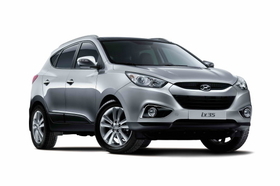 Hyundai plans to sell about 50,000 units of the ix35 in a full year. The ix35 was styled at the company's European design center in Ruesselsheim, Germany and introduces a new design language the automaker calls "fluidic sculpture." Design director Thomas Birkle said fluidic sculpture is rich surfacing detail combined with organic and flowing lines that create a vivid play of light and shadow on the bodywork.